For those customers that require captivated mounting hardware, FilConn can install most any type of clinch nut or Helicoil desired. Usually this value added service is done at no charge to the customer. 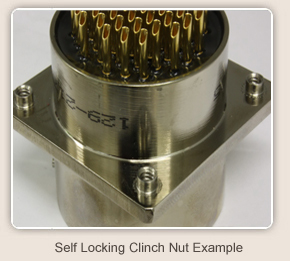 Some photos of clinch nut and Helicoil installations are shown below. If you have a requirement for clinch nut or Helicoil installations, contact one of our engineers to discuss your need. For several customers, we have both, designed and manufactured the filter connector product as well as terminated the connector to the customers' specifications. 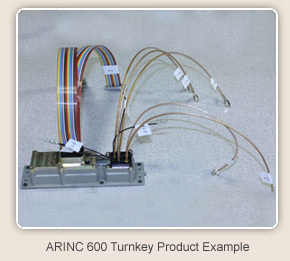 Wire harness terminations can be applied exactly per the customers spec with special materials or labels. This allows the customer to purchase a turnkey product from a single source in addition to relieving customer workload by having FilConn provide a complete turnkey product. 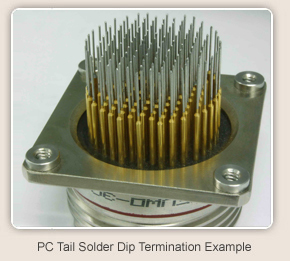 For customers that choose PC tail terminations, FilConn can solder dip the solderable area of the PC tail leads. The solder dip process reduces the occurrence of gold embrittlerment and also allows for easier soldering at the circuit level. For customers that require tight solder dip tolerances, FilConn can incorporate special fixturing technology to meet these tight tolerances. Typical solder used during this process is SN 63/PB37 however for specific requirements FilConn can incorporate any solder type or alloy per the customers requirements. 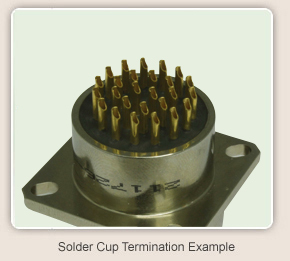 The most common method of terminating custom connector and filter connector products is via a solder cup. FilConn can provide solder cup termination options for all wire gauge sizes and all contact pattern arrangements. 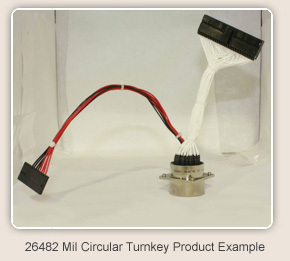 If required, FilConn can orient the solder cups in custom patterns to aid operator assembly or we can rotate single solder cups to precise angles to identify specific contact numbers to make wire harness assembly faster and easier. New equipment is constantly being added to facilitate additional testing requirements. Contact FilConn today to discuss your testing needs. Many customers require the use of alumel and chromel contacts for external temperature measurements. 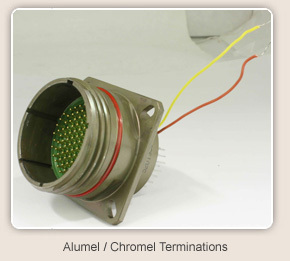 FilConn has many years of experience in incorporating the alumel and chromel material requirements through the connector assembly. The photo shown below is of a 38999 Series III connector with integrated alumel / chromel contacts and external wires which are terminated to a circuit card. 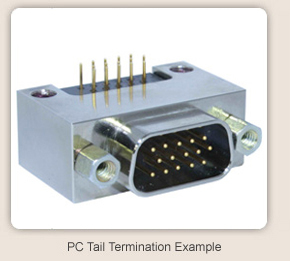 For customers that require the connector to terminate directly to a circuit card, we can offer PC tail terminations. These PC tails can be custom machined to specific diameters if needed and can be arranged in unique patterns per the customers' requirements. The photo below shows a unique PC tail application where a right angle Dsub product was required.